Cupped sequins are easy to figure out. You have an upsidedown side and a cup side. You can stitch them either way, although the cup up is probably more common and more traditional (and also a tad more durable in my opinion). Traditionally the brighter, glossier side is considered the front. 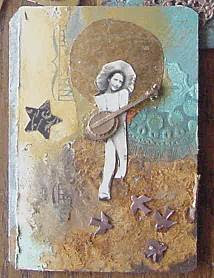 But you can play with using both sides to create nuances of color in your work. My advice would be to be consistent about how you use both sides, and pick a stitch or application where it's really going to show and won't look like an accident. For example, if you're filling an area using overlapping rows, do one row using the fronts and the next row using the backs. You can check out my other tutorials and posts about sequins by clicking "sequins" in the Topics list. What's in a Friend's Name? Sometimes you meet someone and there's an instant rapport. I'm not talking about entertaining each other, little bits of superficial laughter, or any of those rituals of interaction where you establish that you won't eat each other alive, and then there's a "wait and see" about whether you'll become acquantainces, friends, or very good friends. I'm talking instant "I just met a friend today." I'm talking, "Yes, I'd even give you some of my art supplies. Here, take them now." That's me on the left, Leighanna on the right, and a woman I met briefly at the NMBS workshop when I stopped by to plug various upcoming workshops at OFFCenter (and no, if I look bored, I really wasn't. Just antsy to get to work). She and I sat together after the demo and realized we both have the same first name: Mary. 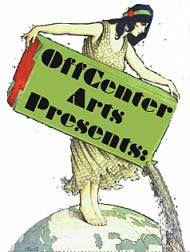 She is Mary O'Hara and she's not one iota Irish. 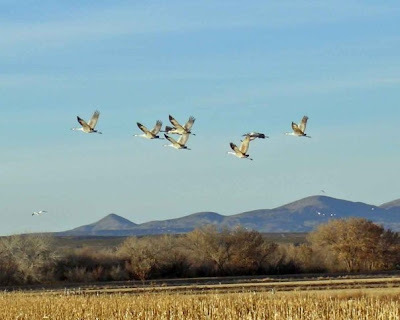 She's Hispanic -- her family is from Chimayo (now there's a power spot on a ley line or two). I'm Mary Tafoya and I'm not one iota Hispanic, but I am 5/8 Irish. Did we get the wrong names? Maybe there was a balancing energy in that, LOL! because I so enjoyed working beside her. She was absolutely fearless in her method and completely accepting of the happenstance results (hey we were slathering patina, gesso, and many other things onto metal). I was being a bit more controlled that day, having learned that if I don't finish it then and there, I'll probably never get back to it. I had a plan. She had a non-plan. So, balance in that too. She reminds me a bit of Betcey Ventrella, and she's got that same grounded, curious, having fun in life nature. Well the whole class had that nice, friendly vibe really, thanks to Leighanna. She was very attentive to everyone, and totally accepting of their stories and backgrounds and work. what I have known before. This morning I woke up early to see that my dear bro had purchased a gift for his friend. He must be quite the night owl because I thought I was up late! New earrings in my shoppe! to go to my Flickr photos. Do you like Rumi's poetry? I do, and I love Persian art too. (In college, I used to copy the compositions, gestures, leaping gazelles, color schemes, etc. with my colored pencils and gold ink.) 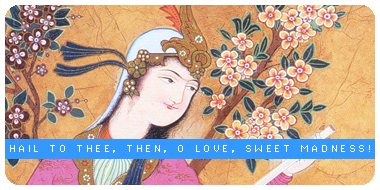 I found this beautiful, clean little application on Facebook and put it on my page, and then found the company that created it, and I see that there's a whole website where you can see these little ATC-shaped (on Facebook anyway) images with a quotation from Rumi on each one. This is the coolest contemporary use of Persian miniature paintings I've seen, and it's also nice to find a Facebook application that does not hang up your page, freak out, stop working, or mislead you into clicking on spammishness. Learn the foundation steps of a twisted wire jewelry project. 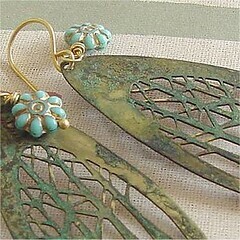 We'll make at least two pairs of earrings using beads, charms and fine wire. A fun and satisfying project for teens to adults! 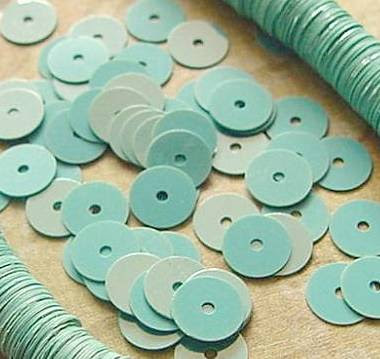 Once you get the hang of these basic steps, you can use extra long lengths of wire and lots of different kinds of beads to create not just earrings, but other jewelry projects and art embellishments. 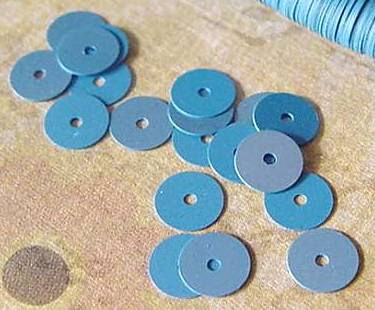 This project is great for using up leftover beads. The angel set will have some flowers and beads (I think) woven into the holes, and I plan to make little hangers for them to hang individually. These were made quite simply with some napkins Leighanna brought to class, milk pogs, vintage cigar box wrapper labels, and some of those embossed pictures that are linked together as a sheet, whatever they're called. 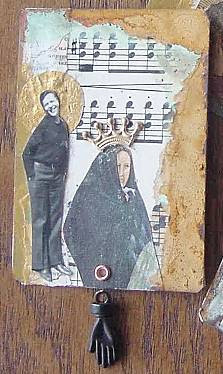 The ordinary saints set will be made up into a deck, after they have the appropriate hardware and geegaws. 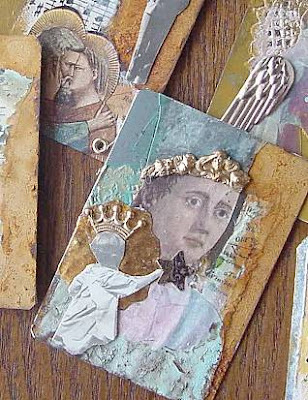 They are made with metal surfacer (coppery patina), images I cut out of a miniature art book, 1930s photos from an old photo album, and vintage jewelry stampings, mostly. I'm always saying you can use sequins as spacers in necklaces and bracelets, but I never actually do it. Sarah has done it, but I couldn't find any examples on her blog (hint, hint). And I'm always wondering what people do with the stuff, er, I mean, delightful finds they purchase from my supply shop. Well, here we go. Mai makes the second Etsy artisan this week who has shared with me her unique vision for my vintage this's and that's. 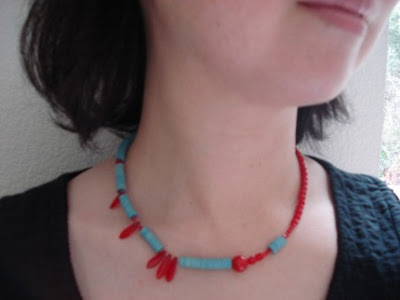 Here she used some vintage turquoise sequins with red beads in a unique, asymmetrical necklace design. Sequins make great spacers because, well, you can use as many or as few as you like. Mai created different lengths of turquoise "tubes." Obviously, this is a different effect than what you can achieve with beads. Cool! By the way, Mai's Etsy shop is called HanaPurse. Check out the great images of newer work by Santa Fe beadwork artist Teri Greeves, who works in bead embroidery (applique) in contemporary Native American themes. Check out the pink high heeled sneakers! 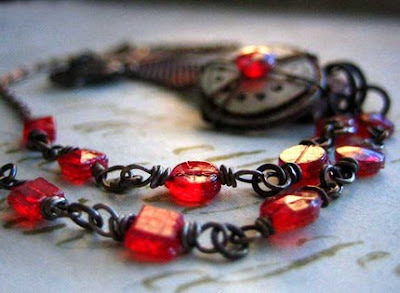 Jan Finnell (OverTheTop on Etsy) used some of my vintage red nailhead beads in the most awesomely unique steampunk style necklace for Valentine's Day. I am so accustomed to stitching these down in bead embroidery projects, I never could have dreamed of using nailheads in links, like Jan has. Wowee, I guess the sky is the limit with a little imagination! 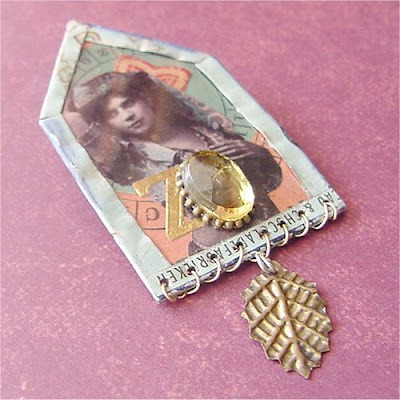 Don't you love the way she wired the nailhead to the center of this pendant? Thanks for sharing this Jan, and here's to seeing it disappear quickly from your shop! But I love it in person. 8-) I put it in my Etsy shop today -- it features a carved bone feather pendant, decorated with turquoise, peach moonstone, and mahogany obsidian stones. 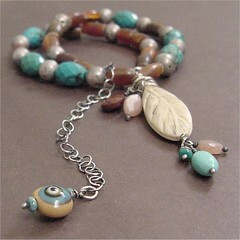 The strand is made with some vintage coin silver beads, faceted turquoise barrels, and wood beads that remind me of amber. I never know what length to make my necklaces, so I've been making them adjustable! The chain on this one has an eye bead for a counterbalance. 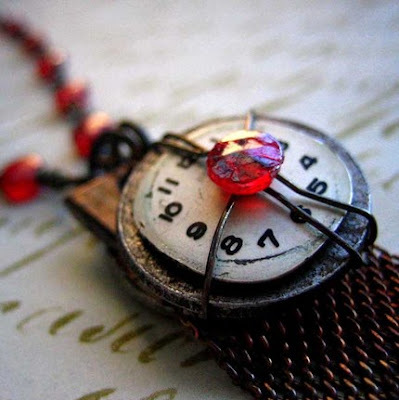 Gotta have your talisman handy, que no?